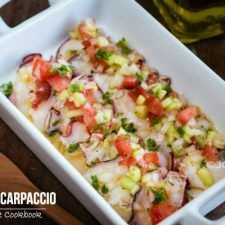 Thinly sliced octopus drizzled with a refreshing lemon-olive oil vinaigrette, Octopus Carpaccio is a popular Italian-inspired food in Japan. 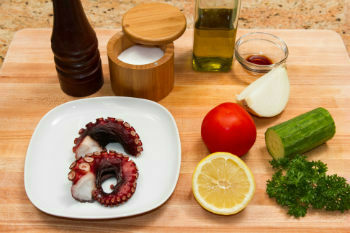 Over here, tender octopus are topped with chopped cucumber, tomato, and sweet onion, making it a fabulous appetizer. Any seafood lovers will fall for this dish! 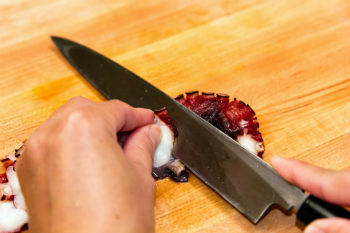 Cut octopus into thin slices. Keeping the core intact, slice the onion widthwise. Then slice lengthwise and cut crosswise. Mince the onion to even size. Soak in water for 10 minutes to get rid of bitter taste. Cut the cucumber in half lengthwise and remove the seeds. Cut the cucumber into thin strips and chop finely. Cut the tomato in half and remove the seeds. Cut into thin strips and chop finely. 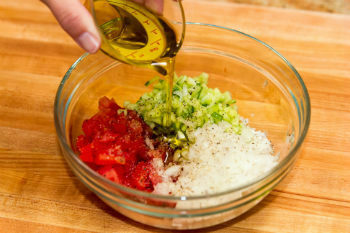 Combine all ingredients in a bowl and add all the seasonings and mix all together. Place sliced octopus on a serving tray and place the vegetables on top. Serve chilled. If you want to know how the Italian prepares the octopus, you can learn it here.